The grapefruit and apple cider vinegar combo diet involves consuming these two items mixed together, either in the form of a beverage or a pill. There are a number of different variations of the diet, some of which just involve drinking a mix of grapefruit juice and apple cider vinegar before meals, and some of which involve using it as a meal replacement and eating very little, if anything, else during the course of the day. This diet is considered a fad diet, so speak with your doctor before attempting to follow it. Eating half a grapefruit or drinking a small glass of grapefruit juice before each meal may help slightly improve your weight-loss results, but you can't count on it as your only weight-loss strategy. Eating a low-calorie premeal snack, such as water, grapefruit juice or half of a grapefruit, resulted in a small amount of weight loss in a study published in Nutrition & Metabolism in 2011, and those who had a grapefruit premeal snack enjoyed an improvement in their cholesterol levels. Another study, published in Metabolism in July 2012, found that eating half of a grapefruit before meals resulted in a small but not clinically significant amount of weight loss, as well as slight decreases in both blood pressure and cholesterol. There hasn't been much, if any, scientific research on the potential for apple cider vinegar to improve weight-loss results, according to a review article published in American Family Physician in November 2004. There's also some risk in drinking apple cider vinegar, especially if it's not mixed with something less acidic. For example, a girl in the Netherlands experienced erosion of her teeth due to drinking apple cider vinegar, according to an article published in Dutch Journal for Dentistry in 2012. A diet consisting of just grapefruit juice and apple cider vinegar is too low in calories and nutrients to be healthy. 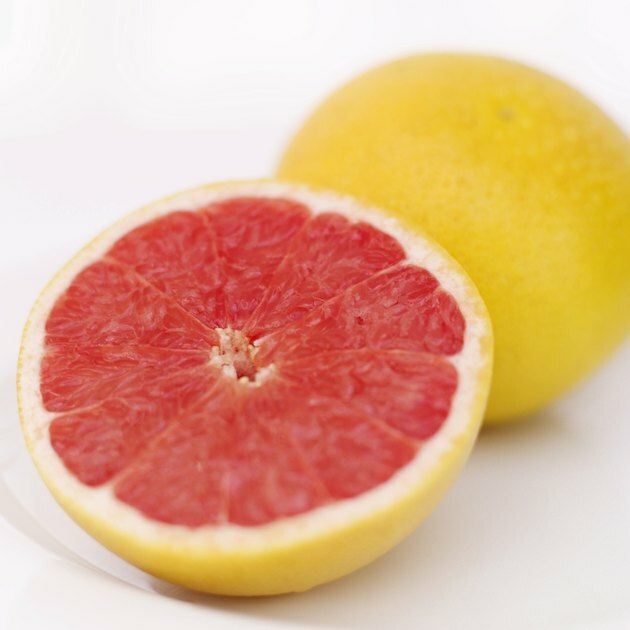 A cup of unsweetened grapefruit juice has 94 calories, and although it provides more than 100 percent of the daily value for vitamin C, it doesn't provide any selenium or vitamins A, B-12, D, E or K.
Fad diets like the grapefruit and apple cider vinegar diet may cause some weight loss, but much of this weight will come right back when you start eating normally again. Fad diets may also increase your risk for certain health conditions, including osteoporosis, high blood pressure, heart disease and cancer, because of their restrictiveness. People on certain medications should avoid this diet, as some medications can interact with grapefruit, leading to either too much or too little of the medication being present in your body at any given time. Check with your doctor to make sure you aren't taking any medications that interact with grapefruit before increasing your grapefruit intake. Include grapefruit as part of a balanced, reduced-calorie diet containing a mix of fruits, vegetables, whole grains and lean protein sources. Cut calories by 500 to 1,000 per day to bring about a healthy weight loss of 1 to 2 pounds per week. One of the better ways to do this is to limit the amount of highly processed foods in your diet. Cut down on foods made with refined grains, as well as sweets, while increasing the amount of low-calorie fruits and vegetables you eat. This will help you cut calories while still feeling full. Exercise regularly throughout the week to improve your weight-loss results. Should Grapefruit Be Eaten Before or After a Meal?